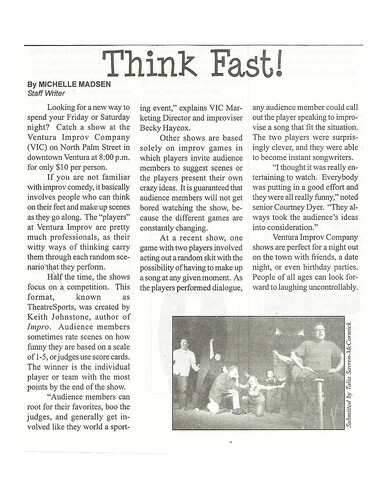 Many thanks to Buena High School student Michelle M, who wrote an article about the VIC and improv for her school newspaper. Great article, Michelle! Looking for a new way to spend your Friday or Saturday night? Catch a show at the Ventura Improv Company (VIC) on North Palm Street in downtown Ventura at 8:00 p.m. for only $10 per person. If you are not familiar with improv comedy, it basically involves people who can think on their feet and make up scenes as they go along. The “players” at Ventura Improv are pretty much professionals, as their witty ways of thinking carry them through each random scenarios as they perform. Half the time, the shows focus on a, competition. This format, known as TheatreSports, was created by Keith Johnstone, author of Impro. Audience members sometimes rate scenes on how funny they are based on a scale of 1-5, or judges use score cards. The winner is the individual player or team with the most points by the end of the show. “Audience members can root for their favorites, boo the judges, and generally get involved like they world a sporting event,” explains VIC Marketing Director and improviser Becky Haycox. Other shows are based solely on improv games in which players invite audience members to suggest scenes or the players present their own crazy ideas. It is guaranteed that audience members will not get bored watching the show, because the different games are constantly changing. At a recent show, one game with two players involved acting out a random skit with the possibility of having to make up a song at any given moment. As the players performed dialogue, any audience member could call out the player speaking to improvise a song that fit the situation. The two players were surprisingly clever, and they were able to become instant songwriters. Ventura Improv Company shows are perfect for a night out on the town with friends, a date night, or even birthday parties. People of all ages can look forward to laughing uncontrollably.